Watch Design TIMECODE receives Red Dot Design Award. The book provides guidelines and practical creative exercises which equip creative-major students in early semesters as well as creative practitioners with fundamental knowledge on creation methods. Combination of functionality, simplicity and aesthetics in modern design is considered a fundamental design principle in the Bauhaus School in Germany, and, inspired by the School, the creative handcrafting exercises and the concepts introduced in this book are primarily coherent with this principle. 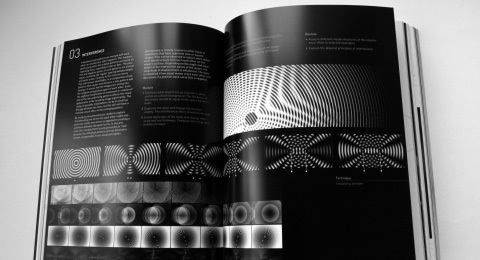 The book draws a direction between two and three dimensional material-based design and modern digital creation process. Digital media are becoming the echo chamber of real processes. Autonomous programmes select, compare and associate information for millions of users. Multi-user platforms are creating virtual biotopes for collective intelligence. Where does the deeper root of these developments lie? The self-organising processes in virtual networks have much in common with the basic behavioural patterns of biological systems. The book explores digital networks, collective information exchange as well as artificial intelligence and life in a bionic context. It also compares structures that process information and organisational methods in both biological and digital systems. Includes more than 150 illustrations. Das Buch beläuchtet historische, gegenwärtige und zukünftige Entwicklungen digitaler Medien aus dem Blickwinkel des Designers Tobias Gremmler, der die digitale Medienwelt seit zwei Dekaden mitverfolgte und mitgestaltete. Grids for the dynamic image provides the first comprehensive study of grid systems needed to bring order to the moving screen. As well as discussing the fundamental elements of space, volume and motion in time-based media, this book and accompanying cd-rom examine more advanced grid system applications such as those which synchronise speech, sound and movement. This book serves both as design resource and educational reference, and will prove invaluable to anyone working in time-based media. Tobias Gremmler was involved in numerous theatre and art productions. On the basis of his involvement with cultural projects, film productions and new media events he acquired an impressive level of specialist skills which enabled him to successfully embark on cross-media development of digital design solutions. The Multi Media Major has an integrative, interdisciplinary and intermedia approach. Due to the ongoing development of digital media and technology, the field for designers became broader and more interdisciplinary. New Media became, beside its own wide development, part of communication design, corporate design, product design, and environmental design and even of architecture. As all these disciplines are based on digital data and technologies. They offer new possibilities to create integrative multi media concepts in order to communicate a message, a product or an appearance throughout different media. Taking this into account the MMD Program offers a wide and intermedia range of digital design methodologies, principles and techniques which cover the communication, interaction, dynamic and space. The MMD Program is based on the synergy of four aspects: research, theory, technology and creativity. The design seminars and projects get across these aspects and enable the students to create substantiated, consistent and media inherent concepts for content, media and platforms. The polarity of method and exploration in the creative process should keep the balance and give the students a wide spectrum of creative experience. The MMD Program prepares the students for several tasks and roles they might cover during their design career after the studies. The MMD Program is considered to enhance the study with knowledge like research methodologies and techniques, business economic strategies and cultural responsibilities and aspects. As working between creative and ongoing changing disciplines, the capability to research new technologies, and methodologies is as essential for the creative and conceptual enhancements of a Multi Media Designer, as having the ability to direct, coordinate and plan. In general the MMD Program educates students for the working fields of: human and information (design of a message), human and digital products (design of digital products and systems) and human and environments (design of digital space (installations)). The MMD Program will enforce degree holder to work in several fields of the multi media design industry. Media design office, Web Agency, IT Productions (Interface design, Information Design) Film production and TV Station (TV Design, Motion Graphics), Exhibition, Fair and Museum (Media installations, Terminals, Showrooms). 1991 - 2008 International tätig als Designer für Neue Medien, Motion Graphics und Interfacedesign. Gestaltung digitaler Produkte, Kommunikationsplattformen und medialer Events für Apple, Adidas, BMW, Getty Images, NEC, O2, Phillips, Samsung, Siemens, Sony, u.a. 1991 - 2009 Kulturproduktionen: Komposition (Musik) und Gestaltung szenischer und interaktiver Inszenierungen in Deutschland, Hong Kong, Indien, der Schweiz, und Taiwan (u.a. 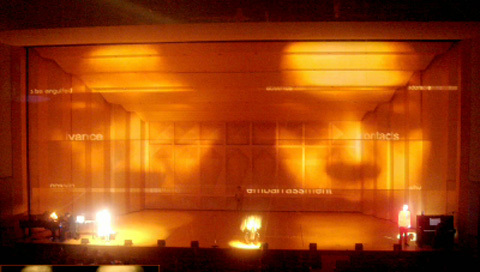 am Culture Center, Hong Kong; Volksbühne Rosa Luxemburg, Berlin). 1995 - 2009 Lehraufträge, Workshops und Vorträge in China, Deutschland, der Schweiz und den USA (u.a. am Art Center College of Design Pasadena; Cleveland Institute of Art; Shantou University, China). 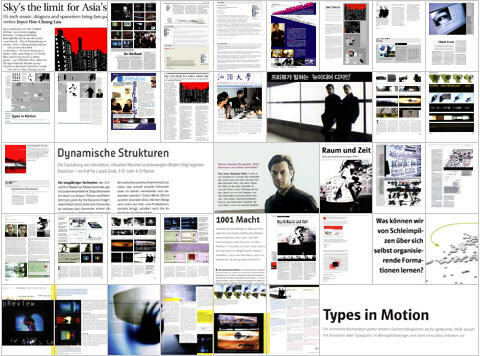 1996 Gestaltung der ersten onlinebasierten Kommunikationsplattformen und Styleguides für Siemens/Nixdorf und SwissRe. 1998 - 2009 Forschung im Auftrag von Unternehmen sowie im Rahmen staatlicher Forschungsprojekte und Hochschuleinrichtungen. (u.a. für Sony, Deutsches Forschungsnetz DFN, Shantou University). Forschungsfelder: Medienkonvergenz, Interfacedesign, Kognition und Design, dynamische Informationsvisualisierung, Augmented Reality. 2000 Gründung der pReview digital design GmbH mit Prof. Tanja Diezmann. Co-Geschäftsführer bis 2004. 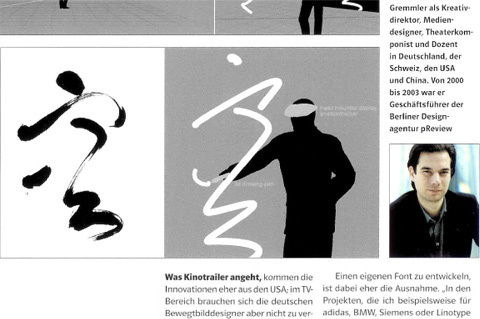 Mitgliedschaft im Art Directors Club Deutschland. 2001 - 2004 Art Contributor für Getty Images, USA; Digital Vision, UK. Publikation von sechs Stock-Footage Motion-Clips DVDs. 2003 Internationale Buchpublikation »Grids for the Dynamic Image« Koautorin: Tanja Diezmann. AVA Academia Publishing (deutschsprachige Publikation: Stiebner Verlag 2005). 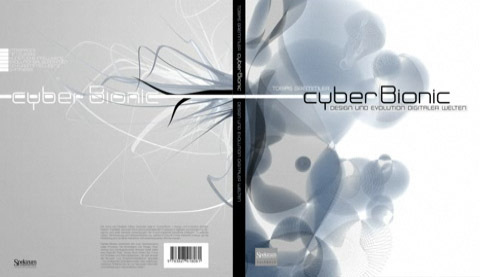 2008 Buchpublikation »cyberBionic - Design und Evolution digitaler Welten« Spektrum Akademischer Verlag.